If you want to have a nice lawn in your yard then it is necessary to fertilize it on the correct schedule and with the right products. So many homeowners decide they are going to take steps to make their yards more beautiful, but then use the incorrect fertilizer at the wrong time. This can cause you to burn the roots of vegetables plants, flowers and grass and you might end up with something that looks far worse than it did before. In this DIY Reviews article about Landscaping, we will discuss what type of fertilizer you should use in your yard, when to use it and how to increase the curb appeal of your home with a beautiful lawn. Some of the biggest mistakes that people make are to use too little, too much or the wrong kind of fertilizer. Below are the effects of each, along with the proper usage of the products. The most important thing you can do for your lawn is to feed it. A well-fed lawn is healthier, which means it has a better root system to combat heat, cold, drought, mowing, foot traffic and other stresses. Fast Release: A fast release fertilizer is the primary you can get your lawn greener more quickly. Usually the most inexpensive option, they are easy to apply, concentrated and inexpensive. Since it is fast release, the nutrients are used quickly by your lawn meaning it will have to be applied more often. These fast release fertilizers are the main cause of burning your grass, because if you put too much on it or apply it on a damp lawn in hot weather, you won’t get the result you were looking for. Slow Release: Much easier to apply, concentrated and less likely to damage your lawn if you use too much. Almost half of what is contained in slow release fertilizers is a water soluble nitrogen, and they are absorbed more slowly into your lawn. Natural Organic: Organic fertilizers contain compost, manure and other compostable products. Since they do not have nutrient additives, you will have to apply more often. There is little risk of damage to your lawn, but you can expect that there will be some weeds in the mix. 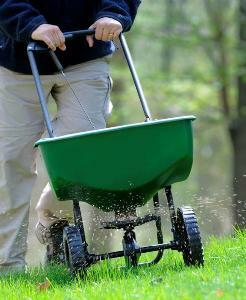 Visit Organic Lawn Care 101 for more great information about natural organic lawn fertilizers. Cool Season Grasses: If you fertilize once a year – Fertilize in September for Northern gasses and in June for Southern grasses. If you fertilize more often, you should have 2 or 3 applications during the fall that are one month apart. Also include one during the Spring. Warm Season Grasses: You should have 3 applications, 1 month apart during the summer. 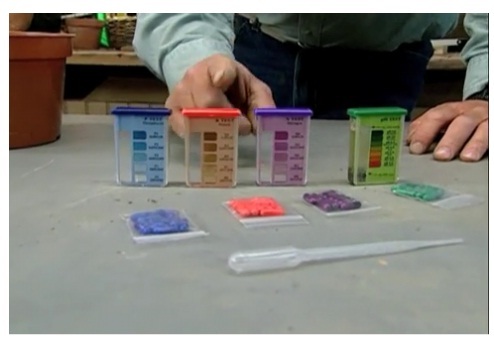 The best way to know exactly what your soil contains and what it needs, is to have a soil test done. Most counties have an agricultural or cooperative extension office where you can inquire about getting a formal test. 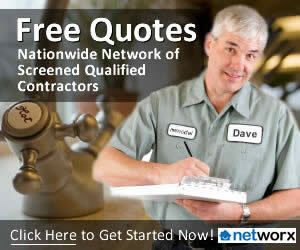 Or, you can contact a professional landscaper and most of them can either do the test for you or have it performed. Next, check the label on the fertilizer. Since they contain nitrogen, phosphorus and potassium, you would read the label as such: 20-5-10 means that it contains 20 lbs of nitrogen, 5 lbs of phosphorus and 10 lbs of potassium. Recommendations for lawn fertilizers are usually given in actual nitrogen over a given area. Experts recommend no more than 1 pound of actual nitrogen per 1,000 square feet for each application. Once you know a fertilizer’s nitrogen concentration, calculate how many times that first, nitrogen-percentage number in the fertilizer mix goes into 100, then apply that many pounds of fertilizer per 1,000 square feet. For example, figure on using 5 pounds of 20-5-10 fertilizer, 10 pounds of 10-2 1/2-5 and so on. The total actual nitrogen applied per year should be 3 to 5 pounds. To double-check your calculations, use Purdue University’s Turf Fertilizer Calculator (www.agry.purdue.edu/turf/fertcalc/Fertilization%20calc.html). Of course, you can always just go read labels, find a fertilizer that states it is good for lawns and get started. But if you are looking for a long term solution, apply the correct fertilizer, at the correct time after you aerate and seed your yard. Do you have any fertilizing tips you would like to share? We love to hear reader tips, so leave us a comment!